GAH!!!! Just last night as I was drifting off to sleep I kept thinking to myself... I need black shoes that are more heel than bootie but will stay on like a bootie but wont look too much like boots. And then I envisioned all the outfits I would wear them with. AND THEN I FIND THESE ON MY DASHBOARD! I swear you are my fashion fairy godmother. Or kindred spirit. Either way, I adore you! The Zanotti boots are calling to me. I need that extra inch and a half. I need those boots now. Happy Thursday, Erika. They're so similar, I'd go for the RSVP. Adorable, droolworthy Giuseppe's!!! You always know what I want!!!! they are so close that I would choose the cheap ones! Thank God, for RSVP! That would be my only way I could afford these beauties. thanks for the contest reminders! yay! totally beautiful! Great cheaper price too. Gorgeous boots! They are so similar but I think I prefer the zip on the Zanottis. You have done it again! Amazing! However, neither of these suit my style really - my toes don't "peep"!! Love them! Def the thrifty version. great find!!! personally i like the tiny bit higher cut on the zanotti's but the rsvp's are amazing as well!! Love it! <3 Happy New Year! Oooo, I might actually have to splurge today! I love the higher heel and the different colour inside and on the sole(?) - I know so little about shoes except that they are b-e-a-utiful. Hope you have a happy new year Erika! i'd definitely save and go for the rsvp ones!! Those Zanottis are calling my name!! I love the little booties..I have some red ones that are very similar to these! Oh you have done it again, j'adore! 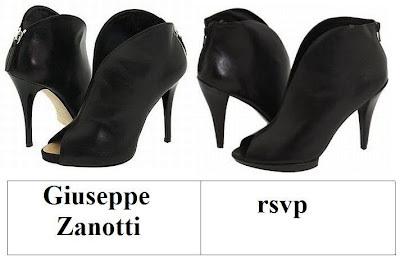 I love the rsvp ones (although just wish they had done the matching silver zip like the Zanotti ones) But I may actually track these down as I never did splurge on a pair of booties this year! p.s. You are featured today at trustyourstle! My favorite is the Giuseppe Zanotti. I'll have to go for the rsvp pair. They look great! I'm such a shoe girl, and heels are my weakness! I'm in love with both of them, but since I am a shoe-obsessed girl I will have to go with the rsvp's so I have more money to spend on future shoes! A girl can never have too many black heels. I'm incredibly tempted by the Giuseppe Zanotti ones. What a great find! Hope you are getting read for a wonderful new year. Those are super cute!! I'd get the cheaper ones--I don't see much difference between the two. The leather on the Zanottis look so much nicer! Maybe it's just the lighting and angle. The shoes from rsvp are a steal! I think I'd be inspired to save on this one. I would so go for the cool cheaper ones..which are expensive enough for me. You know this glam gal... affordable chic, always... but let no one know. Always carry with princess-like attitude. Champagne Sweet New Year Erika! I love having you as a blog friend. Really. Downtown Paris festivities are calling me tonight... and you? they look just as almost the same ! Love these boots! RSVP all the way! What a perfect find -- I love it! These are looking so cool. Totally new idea and beautifully designed. Can be fit with rough and tough dresses.